Hi all! 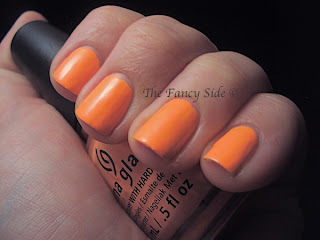 Today I have swatches of 5 of the new Summer Neon shades from China Glaze's On the Shore Collection. I've heard really bad things about these polishes, but I can't help myself, they are just so damn pretty in the bottle. So I approached them differently than others. I actually saw really good results. First lets look at the polishes, then I'll tell you about application. All of these polishes except one, are cremes. I'll let you know when the jelly pops up. Highlight of my Summer, a neon mint color. So unique and so very pretty. That's Shore Bright. This purple is hard to describe. I don't know that I would term it a true neon, just a bright purple. Sun of a Peach. I love this polish, but I had such a hard time photographing it. The color on this polish so doesn't translate well in pictures. I'd recommend looking at multiple swatch photos before committing to this one. It is more of an orange leaning peach in real life. 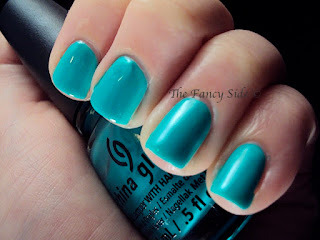 Keepin' it Teal is the one jelly I purchased. 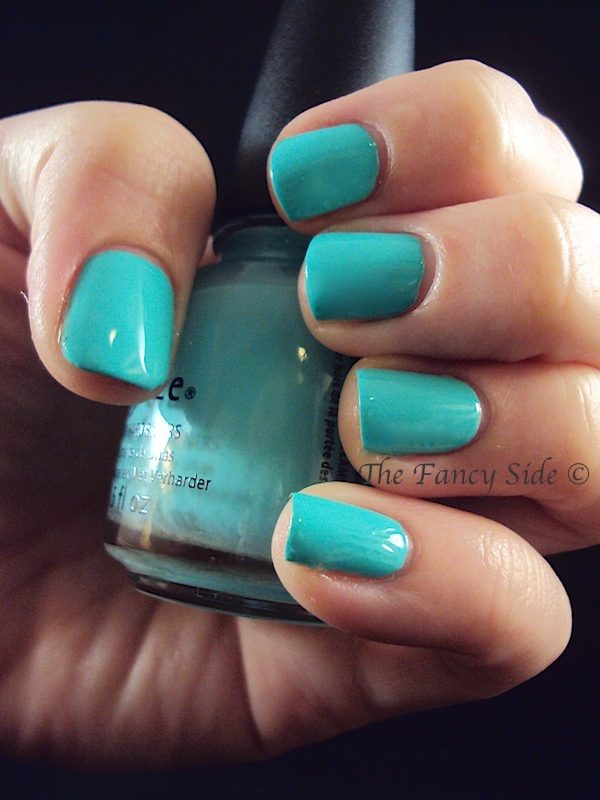 I love this color, but I had issues applying it. I'll touch on my mistakes (not the polishes) at the end. To Yacht to Handle, this is the creme version of Keepin' it Teal. They look so similar to me. This polish did funky things when I added my top coat, most noticeably on my pinkie. See those little waves? They were smooth to the touch, so I don't know what that is. 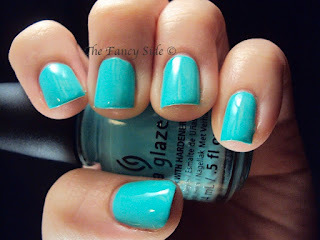 Application wise, I layered all of these polishes over China Glaze White Out. 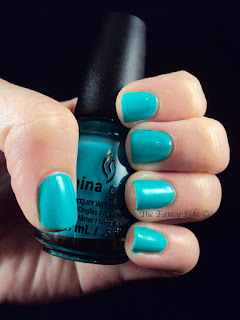 Having that white base and then applying one thick layer of the polish, was kind of a pain, but I didn't run into any of the problems I've heard other bloggers talking about. I did this on purpose, because I wanted to avoid the streaks and polishes I've heard others say appeared for them. 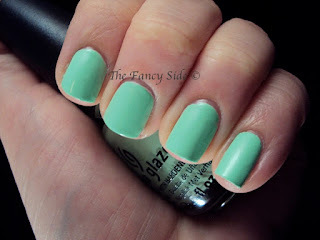 However, with Keepin' it Teal, I should have just built that polish up. For some reason, the white base made that one hard to apply, when it hasn't been a problem child for others. Live and learn. Overall, I love the colors, they are very original for neons. Application, my way, is a giant pain. However, if I just wanted to wear one, not swatch them all, it shouldn't be that much of an issue. What do you think of these neons? It is amazing. Just finicky formula, but oh so worth it. I really like the look of Yacht to Handle! I think that one maybe my favorite of the collection. I really like the look of that neon mint!! I'll have to look for it. Thanks for swatching! Thanks Bailey, it was a favorite of mine. I guess I'm going to have to wait on my I told you so dance, but still...I think they are kind of a major pain. :P I don't know why, but I just refuse to apply a white base even with super sheer jellies like the Essie ones. Meh. I am glad, though, that they worked out for you. You did make them look nice. Good show! I'm sure there will be other "Told You So" dances in your future. The white base does make them a pain application wise, but the payoff is worth it. They are great. I just wish they weren't a pain to apply. I heard these were a pain to apply :( it's a shame because they are all so gorgeous, I am in love with the teal. They were totally a pain. The jelly was great, cremes, meh. You just have to be patient with them, which is so hard. I'm so glad you love the blog. It warms my heart to hear that. Love you!